Can the Mighty Stowe Hold Off a Legion of Challengers? Associate of Stowe Dave L.
Mid post commentary: The Associate of Stowe is a 24/7 full time illustrator who works with Stowe. Her visit to Frost Park last week was likely made to just to size the place up. She has a "chalk stance" of a pro. Be afraid. Dave L. nearly won last week while only using 18 minutes for his piece. His high tech chalking supplies give him a powerful edge. I am looking forward to seeing how he uses 60 minutes. Chris is one of the most successful business people who have integrated their business with a blog. As he was remodeling his restaurant, he would post commentary. By the time The Red Hot was ready to open, a lot of people online felt like regulars already. The victor of this week's chalk off will receive a gift certificate for $20 toward food and drink at The Red Hot. BTW, $20 at The Red Hot is a lot of money. Chris has also agreed to donate the first trophy to the winner of this week's Frost Park Chalk Off signifying the title of "Best Illustrator in the Universe of Tacoma." Yet, the winner of this week will be able to keep this trophy forever. This is not a flimsy plastic bowling trophy or plaque. 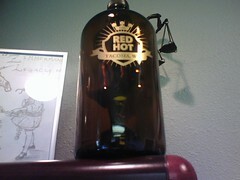 This is an authentic darked glass Red Hot beer storage vessel of a very limited edition. Keep it forever on your mantle in memory of the battle you waged to win it. If you win the coveted trophy this week, the internets will remember your victory forever. No way faster to double your artistic street cred in Tacoma. Final Commentary: Although the skill level of the Frost Park challengers has gone up, anyone can "throw down" chalk and some of the most interesting pieces often come from newcomers. The more the merrier. by CA on 5/8/2008 @ 12:14pm Wow RR. Did you draw in that chest hair? by Erik on 5/8/2008 @ 12:28pm Kevin put the Frost Park Banner on the front page of Feed Tacoma as well as a satellite view of Frost Park. Very cool. by NineInchNachos on 5/8/2008 @ 1:30pm My chest hair is an experiment of intellectual anarchism. I believe that a thick mat of chest hair is beneficial to defend the Government of America and the same chest hair is beneficial to attack the Government of America if it gets "off message" as well. by jamesstoweart on 5/8/2008 @ 1:38pm Mystery Associate of Stowe's name is Dawn. And she is gunning for everyone. As is my four year old son. He is still bitter from his unjust loss from last week. And thanks Kevin for posting my banner. Viva La Chalkalution. by Erik on 5/8/2008 @ 1:43pm Mystery Associate of Stowe's name is Dawn. Cool. Thanks. Despite all of the photosets taken, the blogosphere was just barely able to record her presence at Frost Park last week. Won't happen this week. by NineInchNachos on 5/8/2008 @ 1:50pm are they prepared for the Chalkpocalypse? by Courtney on 5/8/2008 @ 3:13pm Yum, Red Hot! I can taste the dirty nachos now. Bring on the Chalkocaust Sto! by Elle on 5/8/2008 @ 4:35pm I'm guessing I will be at a serious disadvantage since I am currently sporting a killer cold. by Erik on 5/8/2008 @ 4:48pm I'm guessing I will be at a serious disadvantage since I am currently sporting a killer cold. But so much sweeter the victory should you prevail. by killertofu72 on 5/8/2008 @ 10:22pm I dont quite see where it is I sign up but I will be there ready to try my best at this! by Erik on 5/8/2008 @ 10:52pm Thanks for posting killertofu72. I dont quite see where it is I sign up but I will be there ready to try my best at this! All you need to do is show up at noon tomorrow at 9th and Pacific Avenue and start chalking. We try to have as few formalities as possible. Signing up or giving your name is optional. Plus, there are no sign up "sheets." The blogosphere will see your work and document your entry for voting. by NineInchNachos on 5/8/2008 @ 11:05pm yes and no chalk sharking... as in pretending you don't know how to draw and at the last minute whipping out Guernica or something. by Dave L. on 5/9/2008 @ 9:22am I want that prize! Not that Iâ€™d be a serious threat (you guys are too much), but Iâ€™m swamped at work, and given travel-time, I also feel I owe it to my great boss to make it only a once-in-a-while thing. (Or limit my piece to ten minutes.) I canâ€™t come up with a new-idea-a-week anyway. I am stewing on an idea, so I hope no one uses it before I get there again. And seriously, I peak at 18 minutes, so I would disappoint any 60-minute extrapolation. But thanks for including me in the official program. Iâ€™ll be closely following via the internets. by Erik on 5/9/2008 @ 11:06am I want that prize! Not that Iâ€™d be a serious threat (you guys are too much), but Iâ€™m swamped at work, and given travel-time, I also feel I owe it to my great boss to make it only a once-in-a-while thing. Frost Park calls Dave L. You think you are the only one stuck in a cubical? You came within 2 votes of beating the mighty Stowe last time.